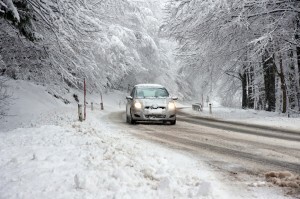 Concluding our blog series Winter Driving Tips to Prevent Car Accidents, here we will present some final winter driving tips to be aware of as you hit the roads this winter. While these winter driving tips can be invaluable, don’t hesitate to contact us when you need help obtaining the compensation you deserve after traffic accidents. Don’t use cruise control – The reason for this is that you need to maintain full control over your vehicle when operating it on icy or slick roads. By maintaining control of your vehicle, you can be sure to immediately respond in the event your vehicle starts to skid. Know how to operate your vehicle in skids – When skids are unavoidable, do your best to stay calm and appropriately operate your vehicle. In general, this will mean that you should slowly step on the accelerator when trying to regain control of a skidding vehicle at speeds slower than 25 mph; at speeds higher than 25 mph, AAA recommends using emergency steering methods to regain control of the vehicle. Don’t drive drunk and minimize your distractions as you drive – Of course, you should never drink and drive, and it’s always essential that you minimize your driving distractions so that you can fully focus on the task of driving. Given that winter weather conditions bring on some new challenges for drivers, it’s absolutely essential that drivers are as diligent, responsible, sober and focused behind the wheel as possible. Behaving recklessly or carelessly when driving on icy winter roads can leads to serious traffic accidents. Check the weather before you leave – It’s always a good idea to check the weather before taking to the roads for longer trips in the wintertime. If the forecast predicts a storm or severe weather conditions, you may want to consider putting off your trip until the weather poses less of a threat to your travels. Keep a winter kit in your vehicle – These kits can help you get your vehicle up and running again, or they can provide you with some essential equipment to keep you safe and warm while you await help. In addition to rope, jumper cables, and duct tape, these kits should include chemical heat pads, a blanket, an ice scraper, and water. Have you or a loved one been hurt in a car crash? If so, Colorado Springs Car Accident Attorney Kenneth Shakeshaft is ready to advocate your rights, help you recover financially and ultimately help you put your life back together. Since 1982, Kenneth Shakeshaft has been providing people injured in traffic accidents with superior legal service, helping them obtain the maximum possible compensation for their injuries, damages and losses.